Adrenal Reset By CTD Sports, 60 Tabs at SameDaySupplements.com® for lowest price. What Is CTD Sports Adrenal Reset? Adrenal Reset is designed to reset adrenal glands and lower cortisol levels while reducing tolerance to stimulants. How Does Adrenal Reset Work? Contains active ingredients that support the body's ability to naturally restore adrenal glands to proper health while lowering cortisol. What's In CTD Sports Adrenal Reset? How Do I Take CTD Sports Adrenal Reset? As a dietary supplement, take 1 tablet of Adrenal Reset in the morning and 1 tablet in the afternoon or as directed by a healthcare professional. 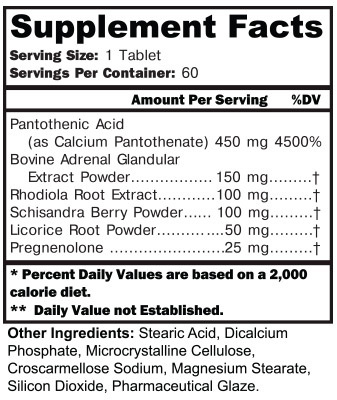 Do not take more than 3 tablets of Adrenal Reset daily. Keep out of reach of children. Do not use if pregnant or nursing. Not intended for use by persons under 18. Do not sure if inner safety seal has been broken. Store in a cool dry place. We have a large selection of in-stock CTD Labs products including Sport Performance items and others for the lowest prices at SameDaySupplements.com® It's always easy to shop for Adrenal Reset By CTD Sports, 60 Tabs at SameDaySupplements.com® because you can browse by reviews, brand, prices or search for specific ingredients using our search tool. In-stock orders placed before 3pm EST ship out the same day to USA, Brazil, United Kingdom, Canada, Germany, Australia, Japan, India, France and worldwide at the cheapest prices online.